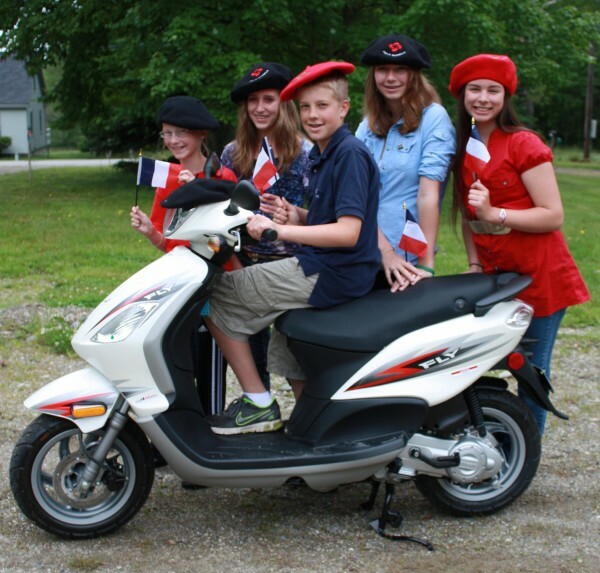 A new Piaggio Scooter from Stanley Subaru of Ellsworth (pictured with some Adams School French exchange students) will be a featured raffle item at the upcoming 2011 Baron’s Auction, scheduled for July 7 on the Castine Town Common. CASTINE, Maine — Parent organizers of the 2011 Baron’s Auction have secured a variety of items for bid at the upcoming, bi-annual summer fundraiser to benefit the Adams School student exchange program with the village of St. Castin, France. Thanks to the outpouring of support for the exchange, items for bid at the July 7 event on the Castine Town Common will include sunset cruises and harbor tours, lakeside vacation stays, organic foods, elegant dinner parties, and nautical-themed gifts. Adding to the momentum of the evening event, organizers will raffle off a new Piaggio Scooter and a new Apple iPad. Bar services, complete with signature cocktails in celebration of the French-themed event, will be provided by The Manor Inn of Castine. Topping the list of live auction items will be a long weekend at a private lakeside cabin located on picturesque Upper Toddy Pond, a sunset cruise for two from Guildive Cruises of Castine, private cooking lessons and gourmet meal preparation in your home from professional chef Tom Gutow, and landscape design services from Green Man Design of Castine. Art enthusiasts will be enticed to bid on a painting by contemporary artist Amy Spangler-Downing and an original David Gray watercolor. Nautical items from Hamilton Marine of Searsport will include a ship’s barometer and two brass ship clocks. Only 200 raffle tickets, priced at $30 each, for the new Piaggio Fly 50 Scooter will be sold, according to organizers. The new alpine white scooter, perfect for summer in Maine, will be on display at Castine’s Camden National Bank lobby on lower Main Street until the event. The fuel-efficient scooter boasts 110-115 mpg and features a 50cc engine. Provided by Stanley Subaru of Ellsworth, the scooter is valued at $3,000 and comes with a 12-month unlimited warranty. A Wi-Fi-enabled, 64 GB Apple iPad valued at $700 will also be a featured raffle item at the auction. Raffle tickets for the iPad will cost $10 each. Tickets for both feature raffle items will be available by advance sale at locations in the community and at the event. The Baron’s Auction will be held 4-7 p.m. and will take the form of an evening social under a large tent located on the Castine Town Common. Adams School students and parents will provide complimentary childcare at the school during the event for auction guests. A silent auction will be followed by a live auction led by volunteer amateur auctioneer Brad Tenney, co-owner of Oakum Bay Real Estate of Castine. A preview period from 4 to 5 p.m. will enable guests to prepare to bid on an exciting variety of services and goods. Admission, set for $15 for individuals and $25 for a household, will entitle guests to a bid paddle and to join in the fun. Tickets will be available at the door or by advance admission ticket sales in the community in early July. Advance event tickets and raffle tickets purchases can also be made by contacting Laurie Flood, 326-8389.